Practice the exercise of Pie Charts at MBA section of jagranjosh.com to ace the Data Interpretation section. Prepare well for your CAT, CMAT, MAT, XAT, IIFT, SNAP etc exams. Directions (1 -5) Study the following Pie-chart carefully to answer these questions. 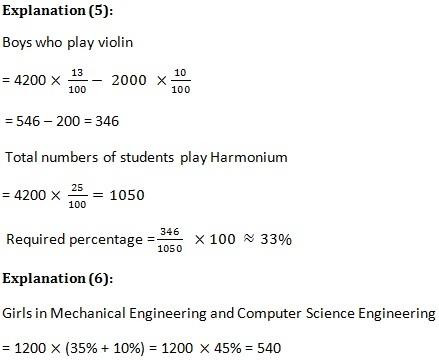 Given below is the % distribution of students who plays different instruments. 1. What is the average number of players (both girls and boys) who play Casio and violin together? 2. 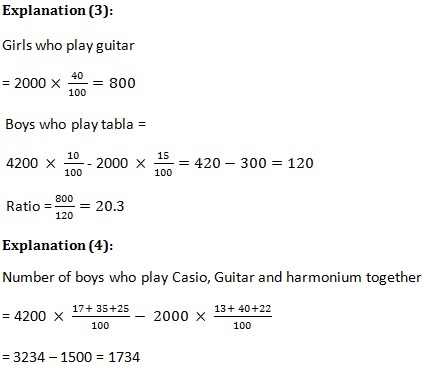 What is the difference between the number of the girls who play Harmonium and the number of boys who play Violin? 3. What is the respective ratio of the number of girls who play guitar and number of boys who play table? 4. What is the total number of boys who play Casio, Guitar and harmonium together? 5. 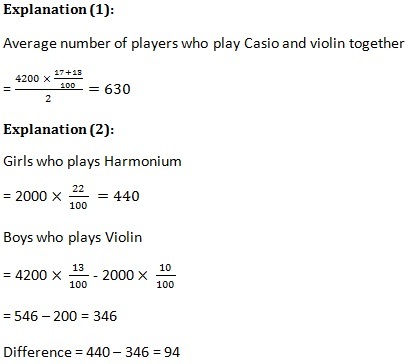 Number of boys who play violin is approximately, what percentage of the total number of students who play harmonium? 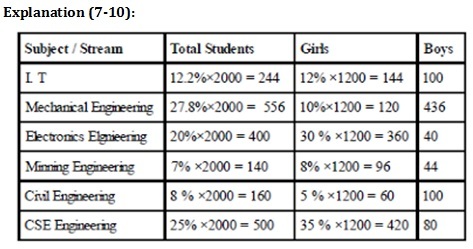 Percentage of students in various courses of Engineering like Electronics, IT, CSE, Mechanical, Mining and Civil Engineering. 6. How many girls are there in course Mechanical Engineering and Computer Science Engineering together? 7. For which pair of courses is the number of boys same? 8. For which courses the number of boys is the minimum? 9. For course I.T. What is the ratio of the boys to girls? 10. What is the total number of student in mining and Computer Science Engineering together? In this section we will explain the rationale for choosing the answer pertaining to every question. After practicing these MCQ(s), you would be able to understand the concepts of Pie Charts.